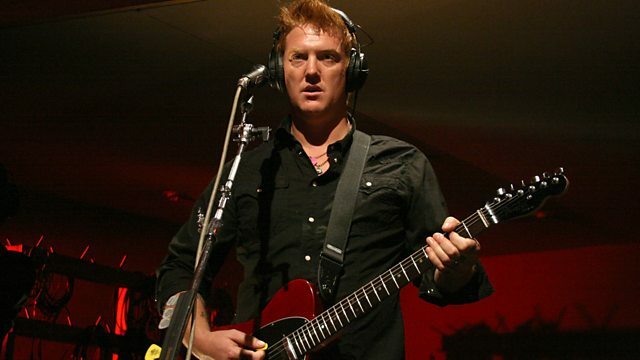 In an episode first broadcast in 2014, Matt Everitt speaks to Josh Homme of Queens of the Stone Age. Josh Homme is a towering presence in alternative rock - be that as a singer, songwriter, producer, frontman with Queens of the Stone Age or just all round cool guy. Josh talks about his time as a punk-obsessed teenager growing up in the Palm Desert, California and the way 'generator parties' (free gigs in the remote desert powered by generators) and bands such as Black Flag shaped his sound and artistic philosophy. He also discusses his time with critically acclaimed stoner rock outfit Kyuss, QOTSA's formation in 1996, his relationship with Dave Grohl, the supergroup Them Crooked Vultures (featuring Homme, Grohl and Led Zeppelin bassist John Paul Jones) and his work as a producer collaborating with Arctic Monkeys. Rated R - Deluxe Edition. THE GOLDEN AGE OF AMERICAN ROCK "N" ROCK VOL 5. BBC RECORDING AT T IN THE PARK 2011.